The Rebel Sweetheart. : Spotlight | Etude House Eraser Show Line Remover Stick. Spotlight | Etude House Eraser Show Line Remover Stick. The first time I saw this meme, I totally cracked up. Because I've had my own share of eyeliner boo-boos, and I can totally relate with this dilemma. Haha! But now that I've discovered this handy makeup tool, I no longer have to worry about 'being a panda'. English text, for your reference. 'This makeup remover cream stick swiftly and precisely wipes away smudges, flaking, and other makeup mistakes. Infused with Argan Oil, it erases even waterproof formula skin.' - So goes the product description. It looks like a Vicks inhaler, lol. The product comes in one size only (2 mL), and the stick itself looks like this. Kinda reminds me of a Vicks inhaler, haha. This one smells really nice, though. The scent actually reminds me of Laneige's Water Sleeping Pack EX. The product is very easy to use, and has a creamy, slightly oily (but not icky) texture when applied. Here's the Line Remover Stick in action. I used it to remove my BYS Waterproof Eyeliner, which is tough against soap and water (ergo, it's really waterproof). The line starts to come off after three swipes of the Line Remover Stick. no traces of the eyeliner left on my skin! - Works effectively, even on waterproof eyeliners. Impressed by the Etude House Eraser Show Line Remover Stick? I am. I'd say this is a must-have for anyone who loves to wear/do makeup (eyeliners, in particular) - whether you're a newbie with makeup or a professional makeup artist or just a makeup junkie (like me) who wants to avoid becoming a panda. Haha! Wonderful product! I will surely buy one for myself too. Kelangan ko din pati ng brown eyeliner kasi naubusan na'ko. I'll probably buy them all from Etude House. Wow! Impressive! I badly need one! This is a MUST HAVE for anyone who ever wears eyeliner-no matter how infrequently. I am going to go check to see if they sell in the US!! surely a very good product and a very nice review from you. whoah! I totally need this one. and cheaper than I expected. 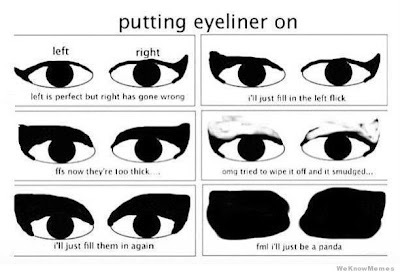 usually i depend on cotton buds + eye remover for removing my corrections on my eyeliner. Yay! I can start using liquid liner again! The pencil liners always smudge, even the fancy, over-priced brands but I got tired of trying to undo all my mistakes with liquid liner. Thank you! This is perfect. That product is seriously cool! I love the meme....how funny lol! I've never seen that product. Gonna have to go look for it! I like the hands-on demonstration. That looks fantastic! Another promising product from the Etude line, I see. I don't really put on eyeliner, because I just never seem to get it right. wow! That's awesome! I've been looking for something like this.Sometimes you think you have it perfect and it just doesn't seem right. Then you try to remove it and it smudges all over! wow! i totally need this! It's nice that it can completely remove the liner as the eyes and the skin can be irritated by unremoved eyeliner.